If you've been wanting a Berkey filter system but balk at paying $200 to $400 for one, I have good news for you! You can actually make your own system using the Berkey filters and substituting food grade storage pails for the stainless steel containers. In less than an hour you can make a system that performs just as well as a stainless steel Berkey at less than half the cost. ​So, exactly how do you do it, and what materials will you need? Read on and find out. I've also included a short video that walks you through the process. You'll be drinking pure great-tasting water in no time! You can click on a topic in the Quick Navigation below, or just scroll down to read the whole article. What Materials Do I Need & Where Can I Get Them? How Do I Make the System? What If I Want to Filter Out Fluoride, Too? Which Size Berkey System Does This Compare To? Can I Use Something Other Than Plastic Food Pails? ​First, you'll need two (2) 5-gallon food grade plastic storage pails with lids. You can usually get them for free from grocery store bakeries or from restaurants, although it seems like they're a little harder to come by than they used to be. Just a word of warning: don't take any pickle buckets! The smell never fades or washes out. Believe me, I've tried! If you can't find any free ones, you can buy them new online. The second thing you need is 2 black Berkey filter elements, which always come in pairs. Click here to check availability and price at Amazon. Last, you'll need a spigot. There are plenty of styles to choose from. Click here to see what's available on Amazon. All you need is a drill with a 7/16" drill bit. Before you get started, make sure that your plastic pails and lids are clean. If you got them from a bakery or restaurant, you're going to want to give them a good scrubbing. You will also need to prime the filters before installing them into the pails. This just involves flushing them with water at your kitchen sink. Instructions for doing this are included when you buy the filters. Basically all you do to make the system is to drill some holes through the plastic and attach the filters and spigot. Simple, right? Johnny does mention, and I will repeat: After your filter is assembled and you fill it up for the first time, you should discard the first batch of filtered water. This is because there is usually some residue left in the filters from the manufacturing process and you want to get it all out. You might even need to do this a second time. The black Berkey filters don't remove fluoride from the water, so you'll need to buy a pair of the optional fluoride/arsenic filters. This isn't included in the video, but it's simple to add them. They just screw on to the bottom of the black filters and then hang down into the bottom bucket. The instructions for attaching them will be included with the filters when you buy them. It's less expensive to buy the black filters and fluoride filters all together as a bundle than to buy them separately. Click here to find the current price on a set of 2 black filters and 2 fluoride filters at Amazon. A pair of black Berkey filters are good for 6,000 gallons of water. Then they should be replaced. Depending on how much water you use, this could last 3-4 years. The fluoride filters, if you use them, need to be replaced every 1,000 gallons. If you use the 5-gallon buckets, this makes a filter approximately equal in size to the Imperial Berkey. For more information on all of the genuine Berkey filter systems, see ​The Berkey Water Filter Ultimate Buyer’s Guide. 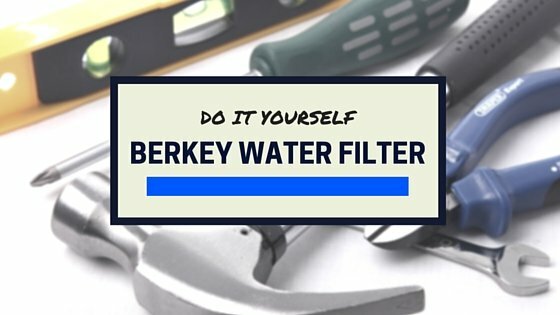 I have seen other homemade Berkey filters made from stainless steel stockpots. Of course, this is a little more expensive than using free plastic buckets, but if you really want to have stainless steel, it's an option. It's just going to be more difficult to do because you'll be cutting metal instead of plastic. Another option is to use large 5-gallon water bottles like the ones water delivery services use. As with stockpots, this involves more than just drilling holes and is a little more complicated than using buckets. It involves using a jigsaw and a box cutter. I'm sure you can google to find more information about it if you're interested. What do you think of this idea? Do you think you want to give it a try? Or maybe you've already made your own filter. If so, how did it go? Let us know in the comments.